Please don't send a reservation request. Please review the rental agreement under the rules and policies, then send a inquiry request. This well kept waterfront smoke free home is the perfect getaway for one or two families. It is only 2 hours from Annapolis. 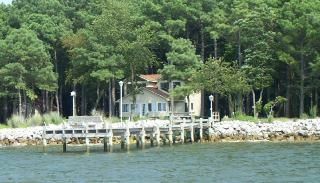 The direct views of the Chesapeake Bay are spectacular from the living room, kitchen, front porch, as well as the 2 master bedroom suites on the second floor. The house is located on 1 acre of private and very quiet property. The two master suites each have a queen bed, and a day bed. They share a 6 foot whirlpool tub, with locking doors from each bedroom. The first floor bedroom also has a queen bed and full bath. The living room also has a sleep sofa. Water views of the Bay are fabulous, whether in the house, or relaxing on our hammock in the shade of the trees, or comfortably sitting on our 80 foot pier. In addition, the Bay offers breathtaking sunsets and relaxing breezes, while watching sailboats, fishing boats and ships cruise along the water. This home is located in the fishing village of Deal Island on the Tangier Sound. If you rise early on a foggy morning, you may experience hearing our loon that loves to swim around the pier. The afternoon brings in the pelicans as they fly overhead and the evenings offer wonderful stargazing. Deal Island has one of the largest concentrations in the state of herons, egrets and ibis. The house is located in a very private sub-division, just a half mile from the deal Island Bridge and marina. You are welcome to bring your boat, kayak or canoe or use our sit in and sit upon kayaks. going for a swim. Both ends of the island offer public boat ramps, where you can see local skipjack and fishing captains. You can paddle to little Deal Island, the marinas, or explore miles of waterways through the 13,000 acres of tidal marshes. Charter fishing and cruises can be reserved with boat captains at Wenona and Deal Island harbours. We can give you local info on renting motor boats, kayaks and canoes. You will also enjoy hiking, fishing or crabbing. This is a great place to relax and decompress from the fast pace of city life. Guests are encouraged to stock up on groceries at the Food Lion in Princess Anne, which also has several Eastern shore-style restaurants, as well as fast food choices. We can also recommend Lucky's Last Chance Grill for those odds and ends, which is ½ mile before the Deal Island Bridge. Wildlife Viewing, Hiking, Fishing, Hunting, and Museums. The middle school down the street also has open tennis courts. Oct 15 - May 16.. $120/wknight .. $350/weekend .. $700/week. May 17 - Jun 30 .. $150/wknight .. $500/weekend .. $900/week. July 01 - Sept 08 ..$170/wknight .. $600/weekend .. $1100/week. Sep 09 - Oct 14 .. $150/wknight .. $500/weekend .. $900/week. Holidays may be charged at a higher rate, please email for pricing. Over 4 adult occupancy: Add $20/night per adult. Maximum of 8 adults $500 Security Deposit is required. Weekend is Friday 4:00pm to Sunday 10:00am. Price includes cleaning, linens, and taxes, no other fees apply. Note: Once we send you a rental agreement you have 24 hours to complete and return it. Your reservation is not complete until we receive your signed rental agreement. Minimum stay during the week is 3 nights.